Well, yeah, it’s a little plastic mouse gun, kind of like a miniature Glock, but it’s soooooo cute. But beyond cute, it is so light, so thin and so small. 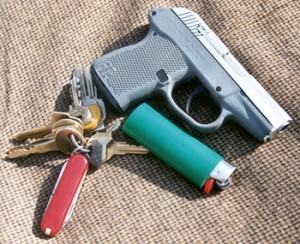 It’s a real pocket gun that rides light but shoots surprisingly well. .32 ACP is not my favorite load, but when you’re looking at a full pistol that weighs only a bit more than a Officer’s Model magazine loaded, some trade-offs can be considered. The ideal application for this pistol is as a backup or as a “deep concealment” piece for those situations and wardrobes for which a larger pistol would be out of the question. 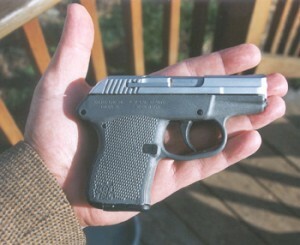 This is a gun that is ¾” wide and weighs just over 9 ounces loaded. The polymer grips come in black, purple, ivory, olive green, gray, light blue, and dark blue. The actual receiver is aluminum with steel parts and inset into the polymer grip. The user can remove the receiver and put it into a different color grip if he or she so desires. For instructions on how to change the polymer grips, click here. The slide and barrel come from the factory blued, but Kel-Tec offers a hard chrome “upgrade” for a very reasonable price. A number of gunsmiths are also specializing in doing hard chrome finishes on P32’s. Reliability – I shot 100 rounds, a box of Winchester SilverTips and a box of Fiocchi hardball. In that 100 rounds, I had four extraction failures and one light primer strike. This was not a performance which inspired confidence. At first, the gun was fine. It was only after I had run five or six magazines of ammo through it and it was getting warm and dirty that it began to act up. I shot 50 rounds or so slow fire, aiming carefully to test the accuracy and get used to the trigger. During this period of slow fire, the gun had no problems. Then I decided to “stress” it by firing fast strings, and using one-handed holds with odd angles of grip to try to make the gun act up. This is when I began to experience problems. The single light primer strike could have been caused by crud clogging the firing pin hole. The same is possible with the extraction failures. Accumulation of powder residue in the chamber could have facilitated the failure. The extraction failure is troubling however, because it is a jam which can only be cleared by removing the magazine and pulling out the spent cartridge. If you had to do this in a fight, you would be toast. As I was leaving the range, I saw an Ishapore Enfield on the wall and, for a moment, I was tempted to trade the Kel-Tyke for the rifle right on the spot, but it didn’t look to me like the Enfield would fit in my pocket very well, so I resolved to figure out the problems with the little gun and fix them, but it doesn’t look like I’ll be retiring the Kimber any time soon. When I bought the gun, I field stripped it, lubed it and put it back together, but that’s all. I didn’t do a detailed chamber and barrel cleaning, and this is a used gun. This evening, I got out the bore light, dental probes, 10x loupe, and Break-Free. I examined everything closely. I kept the four cases which had jammed (all extractor failures, no feed failures) and looked at them under the loupe. They all showed the same mark, that the extractor had gotten fully into the extractor groove on the case and then been pulled forcefully over the lip, taking out a little piece of brass on its way. The extractor is moving freely and doesn’t seem to bind and it has good spring tension. I took one of the failure cases and repeatedly cycled it through the gun. Each time, the extractor went into the groove as it should and then pulled the case out properly, but it did require a tug the first couple of times I did this. I examined the bore and noticed that there were small spots of lead adhered to the wall of the chamber. These were removed with vigorous brushing and a dental probe. I then polished the chamber with fine steel wool (I prefer it to sand paper even though it doesn’t cut as fast). So, the observation is that I could see no indication of a malfunction of the extractor, and it’s not in the serial number range which had the out of spec extractors (a group of P32’s in the 55xxx serial number range had out-of-spec extractors which should be replaced), but I could see a build-up of crud which, coupled with the concentric milling marks in the chamber, could have caused the case to stick in the chamber. I am also reminded that the gun functioned fine through the first 5-6 magazines, and only began to act up after it got very warm and quite dirty during the rapid firing. I also removed the firing pin, cleaned the channel and checked the firing pin. It is quite smooth and does not need polishing. I did manage to shoot the firing pin across the room and only Lady Luck permitted me to find the pin and spring. I didn’t remove the extractor, but it looks to me as if it functioning properly. Consequently, I am not at all ready to give up on the gun, and if I can’t resolve all the problems, I am sure that Kel-Tec can. By all reports, their customer service and commitment to support their guns is second to none. Sights – Impossible. I just can’t hardly see them with my glasses on. This is a function of my not-so-new eyes and the dimness of the indoor shooting range, but for all practical purposes, these sights are simply useless to me unless I happen to not be wearing my glasses. Without the glasses, the sights are perfectly clear. Point shooting will be the order of the day for me to use this pistol. Accuracy – Really pretty good. At seven yards, I shot a ragged hole with some fliers. The pattern fell at 4 o’clock, about 6″ away from center. I suspect that the off-center pattern was probably caused by the way I was seeing the sights. I would like get someone else to shoot the gun, someone with better eyes. Trigger – The trigger is smooth and long, about 6 lbs. with no “catches.” My biggest problem with these kinds of triggers is that, being used to the short, beautiful trigger of the M1911, I sometimes fail to let the trigger go far enough forward to reset. The trigger of the Kel-Tyke doesn’t seem to break until you get it all the way back to the frame. I suppose this is for safety, but I’m not wild about it. Comfort – Little guns hurt my hands. This one is no different. I noticed some discomfort on the underside of my trigger finger after about 50 rounds. Otherwise, shooting the gun is not all that bad. The little gun absorbs much more recoil than you might expect. Well, it is better than throwing rocks. My idea of the optimal personal defense firearm is the M-60: full-auto belt-fed .308 NATO. Now that’s a gun. It will disperse a crowd quickly, is reasonably portable, and can cut down trees for firewood if needed. In the nominal, just barely adequate category would be the AK-47 and M16. The M1911 pistol in .45 ACP is OK if you’re good with it. In my own, highly subjective and intuitive system of combat ballistics, .32 ACP is wishful thinking. Still, I certainly would not want to be shot with one. One commentator characterized the Kel-Tyke as “a nostril gun… You stick it up their left nostril and pull the trigger…” The value of guns such as this rests primarily in their deterrent value – to discourage the evil doer from his course of action. Most people don’t want to be shot with anything be it .22 or .44 Magnum. Interestingly, if the controversial Marshall and Sanow statistics are to be believed (and they will remain controversial until we see their data), the “one shot stop index” of the .32 ACP is surprisingly close to the .380 and .38 Special snubnose, with most of their loads falling in the 60-69% range. The .32 ACP loads tend to fall in the in the 60-63% range of “one shot stops.” For an excellent survey of .32 ACP ballistics, see Golden Loki’s site at http://www.goldenloki.com/ammo/gel/32acp/gel32acp.htm . A friend of mine who recently acquired a P32 and works in a context in which perfect concealment is of paramount importance said, “You know, I have this weird feeling that this is the gun that’s going to save my life because I’ll have it with me.” The “carryability” and “concealability” are so outstanding that some compromise in power may be justifiable. Nevertheless, I would hate to have to take one to a gun fight.